The days run from 9.30 until 4.30 including a 20min break and 45 minute Lunch (packed). We start the day with introductions and icebreakers, then run 3/4 different topics across the day including African drumming, song writing, keyboards and lots more. Myself and my colleagues Emma, Percy and Georgina will all be running the school, so we tend to split the group into smaller groups, those who are slightly older or more experienced, and those who are younger, in order for the children to feel as comfortable as possible. You can book on whichever days suit you, they do not have to be in succession or within the same week. The cost is £35 per day, per child, but we do offer discounts for siblings and bulk bookings! Sessions can be adapted for site facilities, timings or specific focus of the students. We offer workshops in African Drumming, Jazz and Improvisation, Musical theatre, Create your own, Percussion, Song writing, and History of music, but all of these can be adjusted and combined depending on the needs of the school, organisation or family. We offer Music lessons that cover practical and theoretical learning, with a similar structure to our individual lessons. 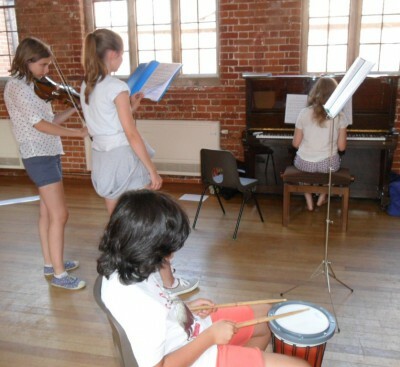 Instruments offered include recorder, piano and vocal studies and can range from 2 to 30 pupils. We direct numerous ensembles including Keyboard clubs and choirs covering a range of Genre's - Pop, Rock Gospel, Jazz, show and Classical.